Like to customize your Android devices? You're going to want an unlockable bootloader on your phone. And while some manufacturers are even producing videos on how to unlock the bootloader on their current and past flagship models, you can decide to pick up the Developer Edition of your Android device, if one exists of course. Usually offered with high-end, flagship models, the Developer Edition of such a handset usually comes with an unlockable bootloader. Even so, if you decide to tempt fate and unlock the bootloader, you will still see your warranty immediately sprout wings (as though it just consumed a can of Red Bull) and fly away from you so far and so fast, that you will never see it again. If possibly losing the warranty, or bricking your phone doesn't faze you in the least, you might like to know that Amazon is now offering the Verizon branded OG Motorola Moto X Developer Edition, on sale for $199.99 off-contract. That is a savings of about $30 from the model's most recently discounted price on eBay. Keep in mind that this unit will run only on Verizon Wireless, PagePlus, or any other Verizon MVNO. 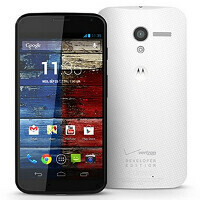 While this is last year's model, there will not be a Verizon branded Developer Edition of the new Motorola Moto X. The Moto X Developer Edition features a 4.7-inch AMOLED screen, with a resolution of 720 x 1280. A dual-core 1.7GHz CPU is under the hood along with 2GB of RAM and 32GB of native storage. A 10MP camera can be found on back of the phone, while a 2MP snapper adorns the front. The 2200mAh battery keeps the lights on. If you know some one (perhaps yourself) who likes to tinker and customize his or her Android phone, this would make a wonderful gift. And at the sale price, you best believe that these pups are going to move fast. Actually it does have GSM. Most of Verizon's phones today have GSM in them, including HSPDA. Its LTE bands are limited and no AWS support. MotoX Developer edition is factory unlocked. You will get service with both AT&T, T-Mobile here in the US. In fact, you will get T-Mobile LTE and even HSPA+ if you live in a refarmed 1900 area, and LTE and HSPA+ on AT&T. BTW this is a great price for this phone. They've been lowering the price of this phone on eBay lately. I think it was once listed at $249 and now been discounted $50 more since then. One thing though is to call/chat with Motorola and verify warranty status, but don't mention you bought the phone off of eBay. Many people have been able to get the warranty on it, just make sure you DO NOT mention you bought it off eBay (or they will deny warranty). When i go to the site, it says it's $249.99. How do i get it to drop to $199.00?